Product code: ES6402 Categories: Sold Items, Sold Jewellery. 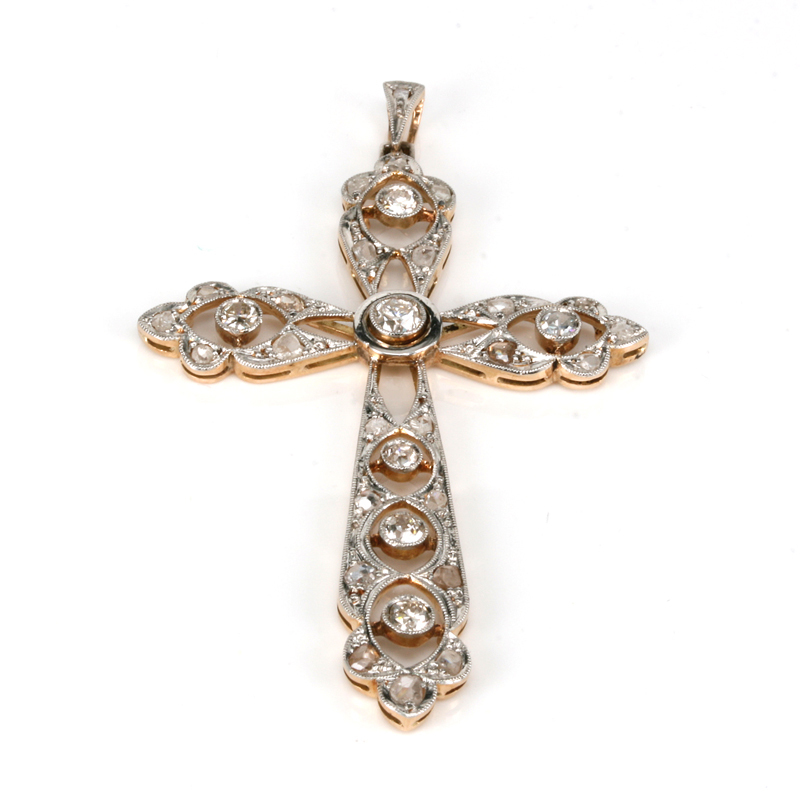 Truly spectacular and amazing, this Art Deco diamond cross is just magnificent in every detail. Exquisitely hand made in the 1920’s, this cross was made in 18ct yellow gold and platinum and has the most delicate and fine open pierce work that itself adds so much charm and character. Many pieces of jewellery during the Art Deco era embraced the use of platinum for its pure white colour and strength and it really allowed such fine work to be created as can be seen here in this cross. Then of course there are the thirty two diamonds that are set into this cross. Out of the thirty two diamonds, there are seven old European cut diamonds and twenty five rose cut diamonds with a total weight of all the diamonds combined being 0.84 carats. Measuring a wonderful 6cm in length by 3.5cm across, there is no doubt that when this Art Deco diamond cross is worn it is sure to be admired and treasured.